The ex-Australian star, So You Think, now trained in Ireland by Aidan O’Brien, emerged victorious by half a length after a titanic battle with last year’s Investec Derby and Arc winner, Workforce, in a scintillating Coral-Eclipse Stakes at Sandown Park. Pacemaker Confront went to the lead in the 10-furlong Group One, but Ryan Moore was happy to let Workforce take over rounding the turn for home and Seamie Heffernan soon followed him through on 4-6 favourite So You Think. Workforce pulled a couple of lengths clear and it appeared he would claim another notable victory, but inside the final furlong So You Think managed to eat into his advantage, getting by him when it mattered to record a half-length success in a pulsating race. Last year's runner-up Sri Putra was third. Heffernan said: "He's just a very good horse and things went smoothly today. I was delighted to be on him. It was a nice pace and it was just like a piece of work as I had a good horse leading me. Hopefully he can keep this up. "He might have been a little bit fresh going to Ascot (when narrowly beaten in the Prince Of Wales's Stakes) and things just didn't go smoothly. He probably did well to come second there." Winning trainer Aidan O'Brien added: "Everything went great, he settled lovely and we are delighted with him. He was where we hoped to have him in Ascot, but those things don't always work out. He's a smart horse and Ascot left him right for today. 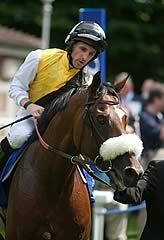 "Seamie followed Ryan and the race started three (furlongs) down. Seamie just sat away, angled him out and he's won nicely. He gave him a lovely ride. I'm delighted for everybody who has put in a lot of hard work. "He's got a lot of options now, he could go back to Australia for something like the Cox Plate (which he has won twice), but we are trying to get the quarantine sorted and it's not that simple. 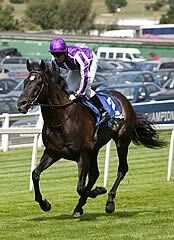 "Otherwise, there is the Irish Champion Stakes and the Juddmonte International. He's a horse who gets a mile and a quarter but has a miler's pace. "As long as he settles, with the speed he has, the sky is always going to be the limit. We wouldn't see going beyond a mile and a quarter being a problem, so everything is open." It was a third victory for Aidan O’Brien in the QIPCO British Champions Series following St Nicholas Abbey’s win in the Investec Coronation Cup and Fame And Glory’s triumph in the Gold Cup at Royal Ascot. It was a first Series victory for the winning jockey, Seamie Heffernan. Basing today’s form around the consistent summer campaigner, Sri Putra, who was beaten five and a half lengths in third, the BHA’s Senior Handicapper, Phil Smith, has assessed So You Think to have run to his current rating of 126. “I’m taking the view that Sri Putra, who performs to his best in the summer, ran to the same form that he did at Ascot, when I gave him a rating of 116,” said Smith. “The five-and-a-half length margin between him and So You Think, which is probably nearer five and three-quarter lengths judged on the time, is equivalent to 10 pounds over a mile and a quarter, so that puts So You Think on 126. 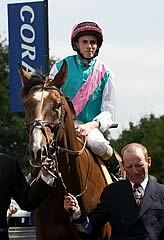 I’ve therefore taken the view that he, like Sri Putra, ran to his Prince of Wales’s Stakes form. Workforce is now likely to contest the fifth Middle Distance leg of the QIPCO British Champions Series, the King George VI and Queen Elizabeth Stakes (sponsored by Betfair) at Ascot over a mile and a half on Saturday 23 July, while So You Think could run in the sixth leg, the Juddmonte International at York over a mile and a quarter on Wednesday 17 August.